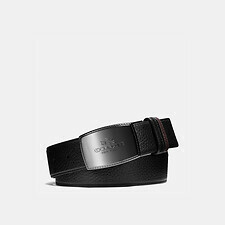 Featuring a logo-embossed plate buckle, this handsome leather belt offers two different looks in one design: signature flair on one side, and a refined solid color on the reverse. It cuts to size with a pair of scissors for the perfect fit. Really amazing belt, gift for my daddy, he loves it!! !